Download "Polycom DMA 7000 Getting Started Guide"
4 DMA Getting Started Guide iv Polycom, Inc.
6 DMA Getting Started Guide Complete the First-Time Setup Worksheet Before you begin system setup, fill out the My System Values column of this worksheet. First-Time Setup Worksheet System Configuration Information My System Values Description Node 1 system name Node 1 IP address Node 2 system name Node 2 IP address Virtual system name Virtual IP address System domain Subnet mask Default gateway Primary DNS server Secondary DNS server Tertiary DNS server Local host name of the first (or only) Polycom DMA system server. Must be a valid host name: the letters a - z (case-insensitive), digits 0-9, and internal hyphens are allowed. Static, physical IP address (dotted quad) for the first (or only) Polycom DMA system server.  Local host name of the second Polycom DMA system server. Not used for single-node installation. IP address for the second Polycom DMA system server. Not used for single-node installation. Local host name of the virtual host. Required even for single-node installation. IP address of the virtual host. Required even for single-node installation. Fully qualified domain name for the system (optional). Network mask that defines the subnetwork of the system. IP address of the gateway server used to route network traffic outside the subnet. IP address of the primary Domain Name System server (optional, but strongly recommended; at least one DNS server is required in order to import global groups from an enterprise directory). IP address of a second DNS server (optional). IP address of a third DNS server (optional). 2 Polycom, Inc.
8 DMA Getting Started Guide 1 USB memory stick containing the Polycom DMA USB Configuration Utility 2 crossover Ethernet cables, short and long (not used for single-server system) Your license documents If you ordered the optional 2-post rack mounting kit, it s in a separate box. A two-node system shipment contains a second set of the above items. 5 Examine the contents for damage. If you find damage, file a claim with the delivery carrier. Polycom is not responsible for damage sustained during shipment. 6 Remove all of the components from their containers. 7 Install the Polycom DMA server(s) according to the server documentation. To rack-mount a server, refer to the Rack Installation Guide and use the brackets provided. 8 Connect the Polycom DMA server(s) to the network: a Connect the GB 1 Ethernet port of each server to the enterprise network. b For a two-node system, connect one of the provided crossover cables to the GB 2 ports of the two servers. Don t turn on the server(s) at this time. 9 Remove the bezel(s) from the server(s). Configure the Polycom DMA System Server(s) You configure the Polycom DMA system server(s) using the Polycom DMA USB Configuration Utility on the USB memory stick. 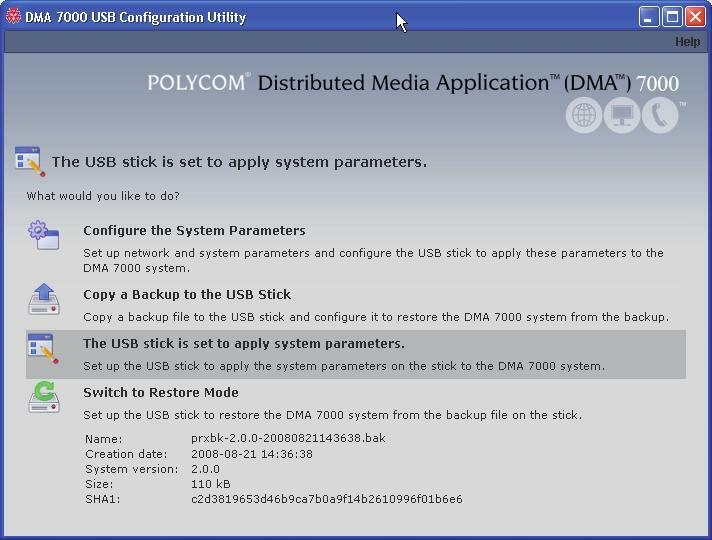 To configure the system server(s) without using the USB memory stick, see Alternate Procedure: Configure the Polycom DMA System Server(s) Without Using the USB Stick on page 8. 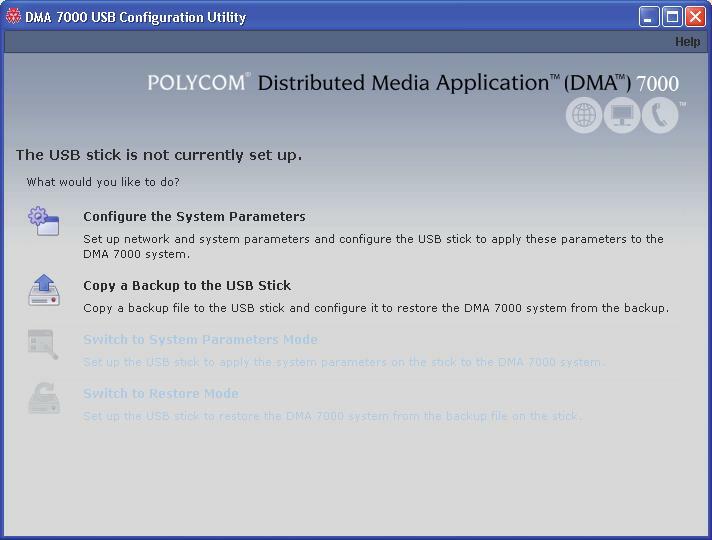 To configure the Polycom DMA system server(s) 1 Connect the USB memory stick containing the Polycom DMA USB Configuration Utility to a Windows PC. 4 Polycom, Inc.
10 DMA Getting Started Guide 7 On the Security Configuration page, select the unsecured access methods you want to enable and deselect the ones you want to disable. Or select High security to disable all those listed. 8 Click Done. The utility confirms that the configuration file was created and returns you to the initial menu. 9 Verify that the initial menu now states that The USB stick is set to apply system parameters. 10 Close the program. 11 In your system tray, click Safely Remove Hardware and select Safely Remove USB Mass Storage Device. When a message tells you it s safe to do so, disconnect the USB memory stick from the PC. The Polycom DMA system software is already installed on the server(s), so the system installation disk isn t needed to set up a new system. Using it overwrites the same software already on the server and needlessly lengthens the setup process. Put the disk away in a safe place in case it s ever needed to restore the system. 12 Make sure that both servers are off. 13 If you need to replace the system software on the server(s) with a different version, turn on the first (or only) server (the one you want configured as Node 1) and insert the system installation disk for that version. Otherwise, continue with the next step. 6 Polycom, Inc.
12 DMA Getting Started Guide Alternate Procedure: Configure the Polycom DMA System Server(s) Without Using the USB Stick If for some reason you don t have or can t use the Polycom DMA USB Configuration Utility on the USB memory stick, the following procedure enables you to complete the initial setup using only a laptop PC and an Ethernet cable. This is possible because Polycom DMA system servers are shipped with default network settings that you can use to connect to the system. The settings are: IP address: Subnet mask: Default gateway: To configure the Polycom DMA system server(s) using a laptop PC 1 Follow the unpack and install procedure (page 3) through step 7. Do not connect the server(s) to the enterprise network. 2 Configure the network settings on your laptop to put it on the same network segment as the Polycom DMA system server(s) (see the server s default settings above). For instance, you can use the following settings: IP address: Subnet mask: Default gateway: Connect an Ethernet cable between your laptop and the GB 1 interface of the first (or only) server (the one you want configured as Node 1). You can use the cable that will later connect the server to the switch (enterprise network). Be sure you connect to the server s GB 1 interface, not the GB 2 interface. 4 On the laptop, point your browser to (if a security certificate warning appears, ignore it) and log in with user ID admin and password admin. The Polycom DMA system s management interface appears, displaying the Dashboard. 5 Go to Configuration > System > Network, enter the network values from the First-Time Setup Worksheet, and click Update. When asked to confirm restarting the system, click Yes. The system begins to reboot. 8 Polycom, Inc.
14 DMA Getting Started Guide 10 Polycom, Inc.
16 Polycom DMA Regulatory Notices Czech Republic Regulatory Notices Canadian Regulatory Notices Class A Digital Device This Class [A] digital apparatus complies with Canadian ICES-003. Cet appareil numérique de la classe [A] est conforme à la norme NMB-003 du Canada. South Korean Regulatory Notices Worldwide Regulatory Notices Warning This is a Class A product. In a domestic environment, this product may cause radio interference in which case the user may be required to take adequate measures. Plugs Acts as Disconnect Device The socket outlet to which this apparatus is connected must be installed near the equipment and must always be readily accessible. La prise électrique à laquelle l appareil est branché doit être installée près de l équipement et doit toujours être facilement accessible. Installation Instructions Installation must be performed in accordance with all relevant national wiring rules. L Installation doit être exécutée conformément à tous les règlements nationaux applicable au filage électrique. 12 Polycom, Inc.
20 DMA 入门指南 iv Polycom, Inc.
22 DMA 入门指南 完成首次安装工作表 在开始系统安装前, 请先填写本工作表中的我的系统值一列 首次设置工作表 系统配置信息我的系统值说明 节点 1 系统名称节点 1 IP 地址节点 2 系统名称节点 2 IP 地址虚拟系统名称虚拟 IP 地址 第一台 ( 或唯一的 )Polycom DMA 系统服务器的本地主机名称 必须为有效的主机名称 : 可使用字母 a - z ( 不区分大小写 ) 数字 0-9, 允许使用内部连字符 第一台 ( 或唯一的 )Polycom DMA 系统服务器的静态 物理 IP 地址 ( 点分四组地址 ) 第二台 Polycom DMA 系统服务器的本地主机名称 并非用于单节点安装 第二台 Polycom DMA 系统服务器的 IP 地址 并非用于单节点安装 虚拟主机的本地主机名称 即使是单节点安装也需设置 虚拟主机的 IP 地址 即使是单节点安装也需设置 系统域系统的完全合格域名 ( 可选 ) 子网掩码 默认网关 主 DNS 服务器 定义系统子网的网络掩码 用于路由子网外网络流量的网关服务器的 IP 地址 主域名系统服务器的 IP 地址 ( 可选, 但强烈建议至少指定一个 DNS 服务器, 以便从企业目录中导入全球群组 ) 从 DNS 服务器第二个 DNS 服务器的 IP 地址 ( 可选 ) 第三个 DNS 服务器第三个 DNS 服务器的 IP 地址 ( 可选 ) DNS 搜索域 时区 NTP 服务器 1 以空格或逗号分隔的完全合格域名列表, 用于在 DNS 服务器上进行查询, 以解析主机名称 ( 可选 ) 系统域将自动添加, 您无须在此输入 系统所在的时区 主 NTP 时间服务器的 IP 地址 ( 可选, 但强烈建议填写 ) NTP 服务器 2 第二个 NTP 时间服务器的 IP 地址 ( 可选 ) NTP 服务器 3 第三个 NTP 时间服务器的 IP 地址 ( 可选 ) 2 Polycom, Inc.
24 DMA 入门指南 配置 Polycom DMA 系统服务器 配置 Polycom DMA 系统服务器时请使用 USB 记忆棒中的 Polycom DMA USB 配置实用程序 若要在不使用 USB 记忆棒的情况下配置系统服务器, 请参阅替代程序 : 不使用 USB 记忆棒配置 Polycom DMA 系统服务器位于页面 7 配置 Polycom DMA 系统服务器 1 将包含 Polycom DMA USB 配置实用程序的 USB 记忆棒连接到 Windows PC 2 出现提示时, 选择运行配置实用程序 如果自动运行程序不工作或者关闭了该程序, 则使用 我的电脑 Windows Explorer 或其他文件管理器导航到该 USB 记忆棒 然后双击 dma7000-usb-config.exe, 启动配置实用程序 3 在 DMA USB 配置实用程序窗口中, 单击配置系统参数 4 在网络页面, 若要安装双节点群集, 请单击启用双节点配置 5 输入从首次设置工作表中获得的网络值, 然后单击下一步 4 Polycom, Inc.
26 DMA 入门指南 Polycom DMA 系统软件已安装在服务器上, 因此设置新系统不需要系统安装光盘 使用该软件覆盖服务器上已存在的相同软件, 且无需延长设置过程 将光盘放置在安全的地方, 以备恢复系统之用 12 确保两台服务器已关闭 13 若需要将服务器上的系统软件更换为不同的版本, 则启动第一台 ( 或唯一的 ) 服务器 ( 您要配置为节点 1 的服务器 ), 并插入该版本的系统安装光盘 否则, 继续下一步 14 在第一台 ( 或唯一的 ) 服务器 ( 您要配置为节点 1 的服务器 ) 上, 将 USB 记忆棒插入 USB 端口并启动 ( 或重启 ) 服务器 关闭第二台服务器 若要更换系统软件, 服务器将从 DVD 启动并开始安装 约 分钟后, DVD 弹出, 服务器重新启动 若不更换系统软件 ( 或在重启后更换系统软件 ), 服务器将从 USB 记忆棒读取其网络及系统参数并进行应用 15 等待前面板 LCD 显示 DMA 就绪 (Ready) 然后拔下 USB 记忆棒并取出光盘 ( 如适用 ) 若正在安装单节点系统, 则跳到步骤 若要安装双节点群集, 则启动第二台服务器 ( 节点 2) 若要更换系统软件, 请将 Polycom DMA 系统安装光盘插入 DVD 驱动器, 关闭该服务器, 然后再次启动服务器 若要更换系统软件, 服务器将从 DVD 启动并开始安装 约 分钟后, DVD 弹出, 服务器重新启动 若不更换系统软件 ( 或若在重启后更换系统软件 ), 服务器将从节点 1 检测并获得其配置设置, 然后加入群集中 完成时, 这两台服务器的 LCD 均显示 DMA 群集 17 在具有到 Polycom DMA 系统的网络接入的 PC 上, 将您的浏览器指向系统的虚拟主机名称或 IP 地址, 并使用用户 ID admin 和密码 admin 登录 此时将显示 Polycom DMA 系统的管理界面, 并且显示仪表板 从它的菜单中, 您可完成您的系统设置 : 安装您的许可证 将 MCU 添加到系统中, 添加 MCU 的会议模板, 然后设置会议默认值 将系统配置成使用网闸 安装安全证书 通过企业目录添加本地用户或整合 Polycom DMA 系统, 管理系统访问并保证系统安全 相关说明和过程, 请参阅在线帮助或 Polycom DMA 操作指南 6 Polycom, Inc.
28 DMA 入门指南 8 转到配置 > 系统 > 系统时间并执行以下操作 : a b 选择与您位置相应的系统时区 选中自动调整夏令时 (Auto Adjust For Daylight Savings) ( 不选择该项会导致问题, 尤其在使用 NTP 服务器时 ) c 在 NTP 服务器下, 输入从首次设置工作表上获得的时间服务器的 IP 地址 ( 或域名 ) 我们强烈建议至少指定一个 ( 最好指定三个 ) 时间服务器 如果可能, 使用 NTP stratum 3 质量时间服务器 d 单击更新 当提示确认重启系统时, 单击是 系统开始重启 重启过程大约需要 3 分钟 重启完成后, 前面板 LCD 显示 DMA 就绪 9 重新登录系统, 并转到配置 > 系统 > 安全配置 10 选择要启用的一或多个非安全访问方法或选择最大安全 单击更新 取决于您所作的设置, 系统可能需要重启 如果是这样, 系统将提示您确认 单击是 如果系统需要重启, 它将开始重启 重启过程大约需要 3 分钟 重启完成后, 前面板 LCD 显示 DMA 就绪 11 如果您正在安装双节点群集, 执行以下操作 : a 将第二台服务器 ( 节点 2) 的 GB 1 以太网端口连接到企业网络 b 将配备的其中一根交叉电缆连接至两台服务器的 GB 2 端口 c 验证第一台服务器 ( 节点 1) 是否正在运行, 前面板 LCD 是否显示 DMA 就绪 然后启动第二台服务器 ( 节点 2) 第二台服务器启动后, 它将检测并从节点 1 获取配置设置, 并加入群集 完成时, 这两台服务器的 LCD 均显示 DMA 群集 12 必要时, 重新登录系统, 并完成系统设置 相关说明和过程, 请参阅在线帮助或 Polycom DMA 操作指南 8 Polycom, Inc.
30 Polycom DMA Regulatory Notices Czech Republic Regulatory Notices Canadian Regulatory Notices Class A Digital Device This Class [A] digital apparatus complies with Canadian ICES-003. Cet appareil numérique de la classe [A] est conforme à la norme NMB-003 du Canada. South Korean Regulatory Notices Worldwide Regulatory Notices Warning This is a Class A product. In a domestic environment, this product may cause radio interference in which case the user may be required to take adequate measures. Plugs Acts as Disconnect Device The socket outlet to which this apparatus is connected must be installed near the equipment and must always be readily accessible. La prise électrique à laquelle l appareil est branché doit être installée près de l équipement et doit toujours être facilement accessible. Installation Instructions Installation must be performed in accordance with all relevant national wiring rules. L Installation doit être exécutée conformément à tous les règlements nationaux applicable au filage électrique. 14 Polycom, Inc.
33 Polycom DMA System עבור התחלה מדריך תוכן 1... Polycom של DMA מערכת שרת של טכניים מפרטים 1... הדרושים הכלים הכנת 2... הראשונה ההגדרה דף מילוי 3... החומרה רכיבי של והתקנה פריקה 4... P olycom של DMA מערכת שרת)י( של התצורה קביעת שימוש ללא Polycom של DMA מערכת שרת)י( של התצורה קביעת חלופי: הליך 8... ה- USB במקל Polycom של DMA מערכת שרת של טכניים מפרטים iii Polycom,Inc. 35 מערכת שרת של טכניים מפרטים Polycom של DMA שרת של הראשונית ההגדרה לביצוע הדרושים השלבים את מתארים אלה סעיפים במערכת צמתים שני בעל שרתים אשכול או אתרים מרובות ועידות לניהול פלטפורמה.Polycom של )DMA ) Distributed Media Application בפרק עיין דו-צומתי, לאשכול חד-צומתית מערכת להרחיב כדי חדש שרת מתקין אתה אם Polycom( של DMA תפעול )מדריך Polycom DMA Operations ב- Guide שני" שרת "הוספת המקוונת. בעזרה או Polycom של D MA למערכת בהצלחה מחובר עצמך את תמצא זה, תהליך של בסיומו M, CU ויחידות משתמשים הגדרת כולל המערכת, של התצורה קביעת את להשלים ומוכן ב- gatekeeper. לשימוש המערכת תצורת והגדרת ארגוני במדריך שילוב הדרושים הכלים הכנת הבאים: הכלים את הכן P, olycom של DMA מערכת שתתקין לפני Polycom של DMA מערכת שרת חבילת 2( עמ )ראה מלא ראשונה הגדרה דף עם: V (, ista או X P Pro( Microsoft Windows ההפעלה מערכת בעל מחשב USB יציאת ומעלה Java 1.6 ומעלה Firefox 2 או ומעלה, Internet Explorer 6 ומעלה Adobe Flash Player Polycom,Inc. 37 מדריך התחלה עבור Polycom DMA System מידע על תצורת המערכת אזור זמן ערכי המערכת שלי תיאור אזור הזמן בו שוכנת המערכת. כתובת ה- IP של שרת זמן N TP ראשי )אופציונלי, אך מומלץ בחום(. כתובת ה- IP של שרת זמן N TP שני )אופציונלי(. שרת NTP מס 1 שרת NTP מס 2 כתובת ה- IP של שרת זמן N TP שלישי )אופציונלי(. שרת NTP מס 3 פריקה והתקנה של רכיבי החומרה מערכת DMA של Polycom משתמשת בשרת Dell אחד או שניים עם סימון מסחרי של Polycom. כדי לפרוק ולהתקין את החומרה 1 אם רכשת פלטפורמות לניהול ועידה מסוג 2000 RMX של Polycom )יחידות MCU( יחד עם שרתי מערכת DMA של olycom P, פרוק והתקן אותם כמתואר ב- Polycom RMX התחלת העבודה עם 2000 )מדריך R MX 2000 Getting Started Guide של Polycom(. 2 בחן את אריזות המשלוח של מערכת DMA של Polycom ובדוק אם ניזוקו. P olycom אינה אחראית לנזקים שאירעו במהלך משלוח המוצר. 3 פתח ובדוק את פתקי המשלוח. 4 פתח את האריזות ובדוק את התכולה. משלוח של מערכת DMA חד-צומתית של P olycom כוללת: שרת אחד של מערכת DMA של Polycom שני כבלי חשמל ערכה אחת להתקנה במעמד )ארבעה עמודים( מפתח שלדה אחד ערכת תיעוד אחת לשרת עותק אחד של מדריך זה, מדריך התחלת העבודה עם מערכת DMA של Polycom דיסק התקנה אחד למערכת DMA של P olycom )מצורף למטרות שחזור; התוכנה המצויה על גבי הדיסק כבר מותקנת בשרת( 3 Polycom,Inc. 39 Polycom DMA System עבור התחלה מדריך לקביעת השירות )כלי C onfiguration ה- Utility את להפעיל בחר לכך, תידרש כאשר 2 התצורה(. באמצעות U SB מסוג הזיכרון למקל נווט כבויה, שהיא או עובדת אינה האוטומטית ההפעלה אם אחר. קבצים מנהל או W (, indows )סייר W indows Explorer שלי(, )המחשב M y Computer כפולה בלחיצה התצורה( לקביעת השירות )כלי C onfiguration ה- Utility את הפעל מכן, לאחר dma7000-usb-config.exe. על DMA תצורת לקביעת השירות )כלי D MA USB Configuration Utility בחלון 3 תצורת את )הגדר C onfigure the System Parameters על לחץ U (, SB בחיבור המערכת(. של הפרמטרים Enable 2-node על לחץ דו-צומתי, אשכול מתקין אתה אם )רשת(, Network בדף 4 דו-צומתית(. תצורה )אפשר configuration )הבא(. Next על ולחץ הראשונה ההגדרה מדף הרשת ערכי את הזן 5 המערכת(: )זמן System Time בדף 6 למיקומך. המתאים המערכת( של הזמן )אזור S ystem time zone את אבחר קיץ( שעון עבור אוטומטי )כוונון Auto Adjust For Daylight Savings את בהותר NTP(. שרתי עם במיוחד לבעיות, לגרום עשויה זו באפשרות הבחירה )הסרת שרתי של התחום( שמות )או ה- PI כתובת את הזן N (, TP )שרתי N TP servers גתחת הראשונה. ההגדרה דף מתוך הזמן בשרתי השתמש לשלושה. העדפה עם אחד, זמן שרת לפחות לציין בחום ממליצים אנו האפשר. במידת תלת-שכבתית, באיכות N TP זמן )הבא(. Next על דלחץ 5 Polycom,Inc. 41 Polycom DMA System עבור התחלה מדריך מקל את הכנס 1(, כצומת להגדירו שברצונך )השרת היחיד( )או הראשון בשרת 14 השני השרת את הותר השרת. את מחדש( אתחל )או ואתחל U SB ליציאת U ה- SB כבוי. מתחילה. וההתקנה D, מ- VD מאתחל השרת המערכת, תוכנת את מחליף אתה את מחדש. יאותחל והשרת יצא D ה- VD דקות, כ לאחר האתחול(, לאחר אותה מחליף הנך אם )או המערכת תוכנת את מחליף אינך אם אותם. ומחיל U ה- SB ממקל שלו והמערכת הרשת של הפרמטרים את קורא השרת שבלוח L ה- CD מסך ידי על מוכן( D MA( DMA Ready ההודעה להצגת המתן 15 אתה אם האפשר. במידת הדיסק, את והוצא U ה- SB מקל את נתק מכן, לאחר הקדמי. 17. לשלב דלג חד-צומתית, מערכת מתקין אתה אם 2(. מס )צומת השני השרת את הפעל דו-צומתי, אשכול מתקין אתה אם 16 Polycom של DMA מערכת התקנת דיסק את הכנס המערכת, תוכנת את מחליף מחדש. אותו והפעל השרת את כבה D, ה- VD לכונן מתחילה. וההתקנה D, מ- VD מאתחל השרת המערכת, תוכנת את מחליף אתה את מחדש. יאותחל והשרת יצא D ה- VD דקות, כ לאחר האתחול(, לאחר אותה מחליף הנך אם )או המערכת תוכנת את מחליף אינך אם את ומחבר 1, מס מצומת אותם ומקבל שלו התצורה הגדרות את מזהה השרת ההודעה את מציגים השרתים שני של L ה- CD מסכי זו, פעולה סיום לאחר האשכול. מוכן(. D ה- MA )אשכול DMA Clustered המארח לשם שלך הדפדפן את כוון למערכת, רשת גישת לו שיש מחשב מתוך 17 admin המשתמש מזהה עם והיכנס ה- PI לכתובת או המערכת של הווירטואלי.admin והסיסמה Dashboard את ומציג מופיע P olycom של DMA מערכת של הניהול ממשק המערכת: הגדרת את להשלים תוכל שלו, התפריטים מתוך המחוונים(. )לוח שלך. הרשיון)נות( את התקן את והגדר ה- MCU, ליחידות ועידה תבניות הוסף למערכת, M CU יחידות הוסף הוועידה. של המחדל ברירות ב- Gatekeeper. לשימוש המערכת תצורת את הגדר אבטחה. אישורי התקן שילוב ידי על והן מקומיים משתמשים הוספת ידי על הן למערכת, הגישה את נהל המערכת. את ואבטח הארגוני, במדריך P olycom של DMA מערכת DMA תפעול )מדריך Polycom DMA Operations ב- Guide או המקוונת בעזרה עיין הרלוונטיים. והתהליכים התיאורים לקבלת P ( olycom של 7 Polycom,Inc. 43 Polycom DMA System עבור התחלה מדריך וחבר הנייד מהמחשב ה- Ethernet כבל את נתק מחדש, אתחול מבצע שהשרת בזמן 6 הארגונית. הרשת אל השרת של GB1 ממשק את הלוח של ה- LCD מסך התהליך, בסיום דקות. כשלוש נמשך מחדש האתחול תהליך מוכן(. DMA( DMA Ready ההודעה את מציג הקדמי שלך הדפדפן את כוון,Polycom של DMA למערכת רשת גישת לו שיש מחשב מתוך 7 המשתמש מזהה עם והיכנס ה- PI לכתובת או המערכת של הווירטואלי המארח לשם.admin והסיסמה admin זמן > מערכת > )תצורה C onfiguration > System > System Time אל עבור 8 הבאות: הפעולות את ובצע מערכת( למיקומך. המתאים המערכת( של הזמן )אזור System time zone את אבחר שעון עבור אוטומטי )כוונון Auto Adjust For Daylight Savings את בהותר NTP(. שרתי עם במיוחד לבעיות, לגרום עשויה זו באפשרות הבחירה )הסרת קיץ( לש התחום( שמות )או ה- IP כתובת את הזן N (, TP )שרתי N TP servers גתחת הראשונה. ההגדרה דף מתוך הזמן שרתי השתמש שלושה. לציין עדיף ניתן ואם לפחות, אחד זמן שרת לציין ממליצים אנו האפשר. במידת תלת-שכבתית, באיכות N TP זמן בשרתי על לחץ המערכת, של מחדש הפעלה לאשר כשתתבקש )עדכון(. Update על דלחץ )כן(. Yes מסך התהליך, בסיום דקות. כשלוש נמשך התהליך מחדש. אתחול מבצעת המערכת מוכן(. DMA( DMA Ready ההודעה את מציג הקדמי הלוח של ה- LCD Configuration > System > Security אל ועבור למערכת בחזרה התחבר 9 האבטחה(. תצורת > מערכת > )תצורה C onfiguration Maximum בחר או לאפשר כדי מאובטחת הלא הגישה משיטות יותר או אחת בחר 10 )עדכון(. Update על לחץ מרבית(. )אבטחה security נדרש אם המערכת. של מחדש באתחול צורך שיהיה ייתכן שקבעת, להגדרות בהתאם )כן(. Yes על לחץ לאשר. מתבקש אתה אתחול, דקות. כשלוש נמשך התהליך מתבצע. האתחול המערכת, של מחדש אתחול דרוש אם DMA Ready ההודעה את מציג הקדמי הלוח של ה- LCD מסך התהליך, בסיום מוכן(. DMA( הבאות: הפעולות את בצע דו-צומתי, אשכול מתקין אתה אם 11 הארגונית. הרשת אל 2( )צומת השני השרת של GB 1 Ethernet יציאת את אחבר השרתים. שני של G B 2 ליציאות המוצלבים מהכבלים אחד בחבר את מציג הקדמי הלוח של ה- LCD ושמסך פועל 1( )צומת הראשון שהשרת גודא. )2 )צומת השני השרת את הפעל מכן, לאחר מוכן(. DMA( DMA ההודעהReady שלו התצורה הגדרות את ומקבל מזהה הוא אתחול, מבצע השני שהשרת לאחר שני של L ה- CD מסכי זו, פעולה סיום לאחר האשכול. את ומחבר 1, צומת מתוך מוכן(. D ה- MA )אשכול DMA Clustered ההודעה את מציגים השרתים בעזרה עיין המערכת. הגדרת את והשלם הצורך, במידת למערכת, בחזרה התחבר 12 לש DMA תפעול )מדריך P olycom DMA Operations ב- Guide או המקוונת הרלוונטיים. והתהליכים התיאורים לקבלת P ( olycom 9 Polycom,Inc. 46 Polycom DMA Regulatory Notices Czech Republic Regulatory Notices Canadian Regulatory Notices Class A Digital Device This Class [A] digital apparatus complies with Canadian ICES-003. Cet appareil numérique de la classe [A] est conforme à la norme NMB-003 du Canada. South Korean Regulatory Notices Worldwide Regulatory Notices Warning This is a Class A product. In a domestic environment, this product may cause radio interference in which case the user may be required to take adequate measures. Plugs Acts as Disconnect Device The socket outlet to which this apparatus is connected must be installed near the equipment and must always be readily accessible. La prise électrique à laquelle l appareil est branché doit être installée près de l équipement et doit toujours être facilement accessible. Installation Instructions Installation must be performed in accordance with all relevant national wiring rules. L Installation doit être exécutée conformément à tous les règlements nationaux applicable au filage électrique. 16 Polycom, Inc.
50 DMA 시작안내서 iv Polycom, Inc.
52 DMA 시작안내서 최초시간설정워크시트작성 시스템설정을시작하기전에이워크시트의내시스템값난을작성하십시오. 최초시간설정워크시트 시스템구성정보내시스템값설명 노드 1 시스템이름 첫번째 ( 또는유일한 ) Polycom DMA 시스템서버의로컬호스트이름입니다. 유효한호스트이름을기입해야합니다. 문자 a - z( 대소문자구분안함 ), 숫자 0-9 및내부하이픈을사용할수있습니다. 노드 1 IP 주소첫번째 ( 또는유일한 ) Polycom DMA 시스템서버의정적, 물리적 IP 주소 ( 네자리로구분 ) 입니다. 노드 2 시스템이름노드 2 IP 주소가상시스템이름가상 IP 주소 두번째 Polycom DMA 시스템서버의로컬호스트이름입니다. 단일노드설치에는사용되지않습니다. 두번째 Polycom DMA 시스템서버의 IP 주소입니다. 단일노드설치에는사용되지않습니다. 가상호스트의로컬호스트이름입니다. 단일노드설치에도필요합니다. 가상호스트의 IP 주소입니다. 단일노드설치에도필요합니다. 시스템도메인시스템 ( 옵션 ) 의완전한도메인이름입니다. 서브넷마스크시스템서브네트워크를정의하는네트워크마스크입니다. 기본게이트웨이 네트워크트래픽경로를서브넷외부로지정할때사용되는게이트웨이서버의 IP 주소입니다. 1 차 DNS 서버 1 차도메인이름시스템서버의 IP 주소입니다 ( 옵션이지만적극권장합니다. 엔터프라이즈디렉토리의전역그룹을가져오기위해서는하나이상의 DNS 서버가필요합니다 ). 2 차 DNS 서버 2 차 DNS 서버 ( 옵션 ) 의 IP 주소입니다. 3 차 DNS 서버 3 차 DNS 서버 ( 옵션 ) 의 IP 주소입니다. DNS 검색도메인 호스트이름 ( 옵션 ) 을확인하기위해 DNS 서버에서질의하는완전한도메인이름의스페이스또는쉼표로분리된목록입니다. 시스템도메인이자동으로추가되므로여기에입력할필요가없습니다. 표준시간대시스템이상주하는시간대입니다. NTP 서버 #1 1 차 NTP 시간서버의 IP 주소입니다 ( 옵션이지만적극권장합니다 ). NTP 서버 #2 2 차 NTP 시간서버 ( 옵션 ) 의 IP 주소입니다. NTP 서버 #3 3 차 NTP 시간서버 ( 옵션 ) 의 IP 주소입니다. 2 Polycom, Inc.